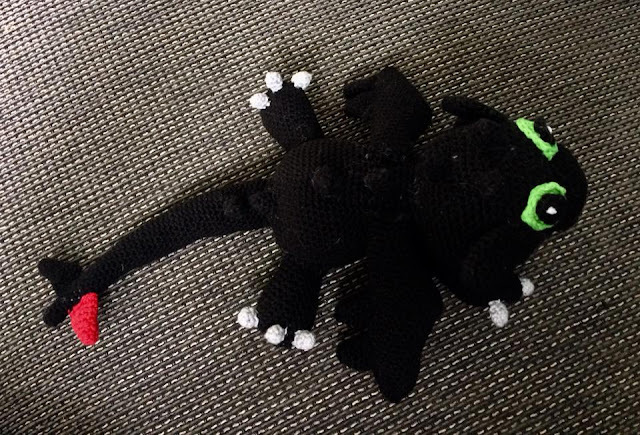 For Halloween I had lots of nice projects in mind that I wanted to make, but after discovering a great Etsy Pattern Store called The Velvet Acorn, knitting fever came over me and all planned projects had to give way. The first thing I made, is this one for my youngest daughter, called the Azel Pullover. 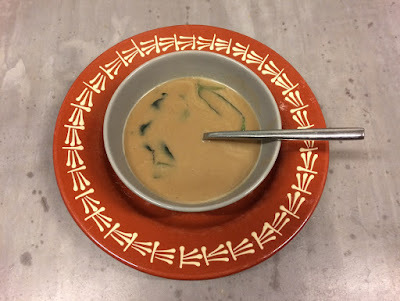 Did you try the delicious Chestnut Soup recipe I shared last week? To serve beside I made Buttermilk Corn Bread, that went wonderfully well together with the soup because of the sweetness of the bread. Next week I want to make what seems the most heavenly cake ever! My daughter had a birthday party of a class mate this week and asked me to make a card. 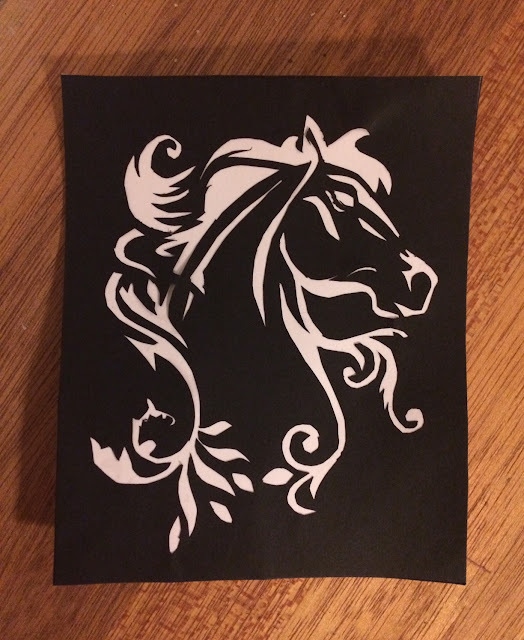 The girl who was having her birthday is a horse girl (not entirely sure this is a word other languages recognize, but 'horse girl' is a Dutch word for girls with a life that's totally about horses), so the card, and the presents of course, had to do something with horses. Years ago I made some paper cutting art (didn't blog back then, so I'm very sorry to say that the paper cut heart isn't recorded anywhere here on this blog) with a Martha Stewart pattern and just this weekend I found the little knife I used for for the cutting, so it seemed like a nice idea to pick up the paper cutting art to make a nice horse card. A colleague of mine is totally into Japan and has traveled around there for three times now. 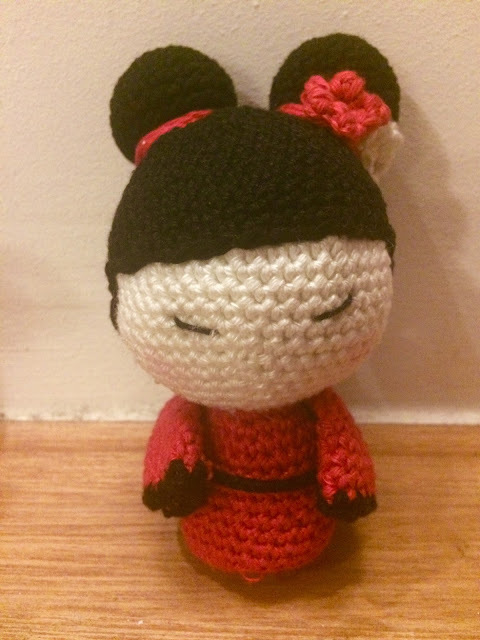 The last time she was in Japan she shared a couple of pink children's chopsticks on Instagram to let everybody know she was expecting a little girl, so making a little kokeshi doll for the baby seemed logical. Frankenstein, Zombie Brian and Vlad were all featured by Strawberry Butterscotch! Thank you very much, Anna! So simple to make and so totally tasting like fall, that's the Chestnut Soup I made this week! I didn't follow the recipe entirely, to be honest. I left out the mushrooms, because except for me no one in my family and/or circle of friends likes mushrooms. To make the soup creamy I put some creme fraiche in it at the end. Instead of thyme I used sage, because sage is just a herb I really love and it has an evenly strong taste as thyme. For the cooked chestnuts I used chestnut puree, just because cooked chestnuts were nowhere to be found in the little underdeveloped town I live in. The last time I made a pinata I posted a picture on my personal Facebook account and told people I accept orders. I didn't expect much of it, because most people prefer fabric made things because it's so much cheaper. And you wreck the pinata anyway. 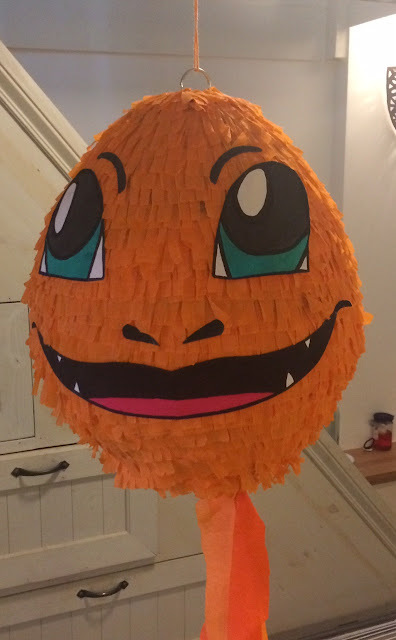 But two weeks ago a friend of mine asked me to make a Pokemon related pinata, most desirable a figure named Chamander (don't know about you, but I had to google), because that's her son's favorite. 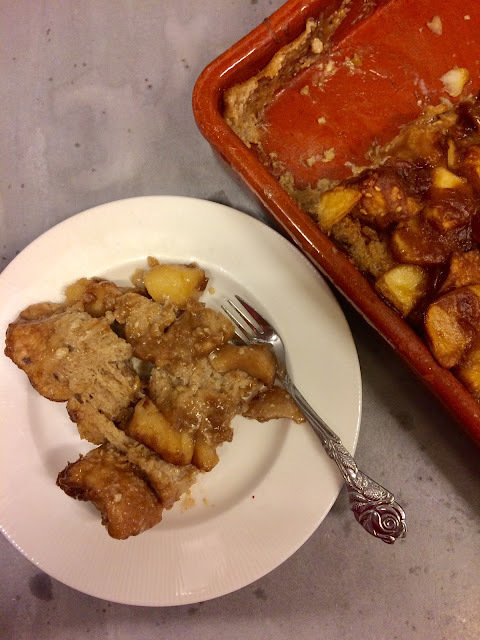 Very sorry that I didn't post the Apple Pie Bread Pudding that I had planned to make last week. Well, not only planned, but actually made, except that I forgot to take pictures. And after making and eating the whole pudding, I didn't feel like making another one soon. Not because it didn't taste good (because it did), but I had to cook and bake a lot of other things for the friends that came over for my birthday. But this morning I made the pudding and it's even better than I remembered! For next week I want to make a real Fall Recipe, namely Chestnut Soup! I really love the taste of roasted chestnuts, but never tried a soup with chestnuts in it, so this will be a try out. For Halloween I made the Lalylala Halloween Series (see here for Frankenstein, here for Zombie Brian and here for Diego Sugar Skull). 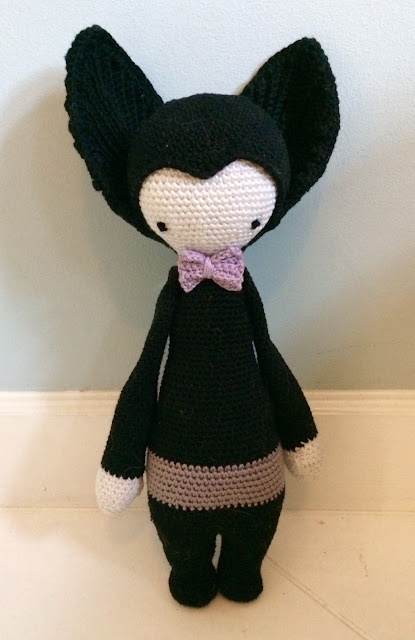 Another pattern from Lalylala that I wanted to make for years, was Vlad the Vampire Bat. 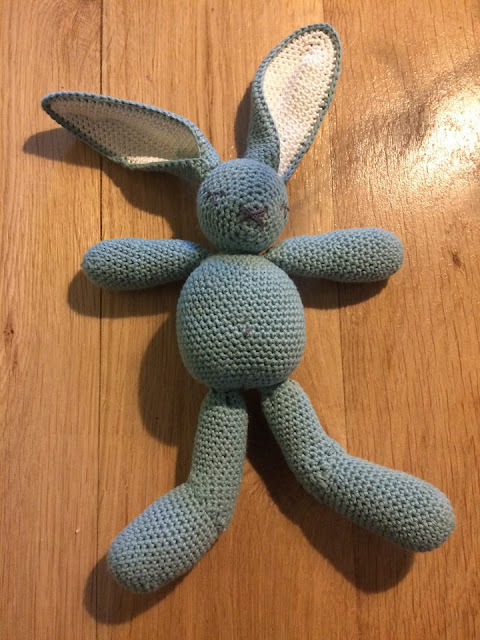 Lalylala designed and wrote patterns for lots of dolls like this; same body, but different appearance. 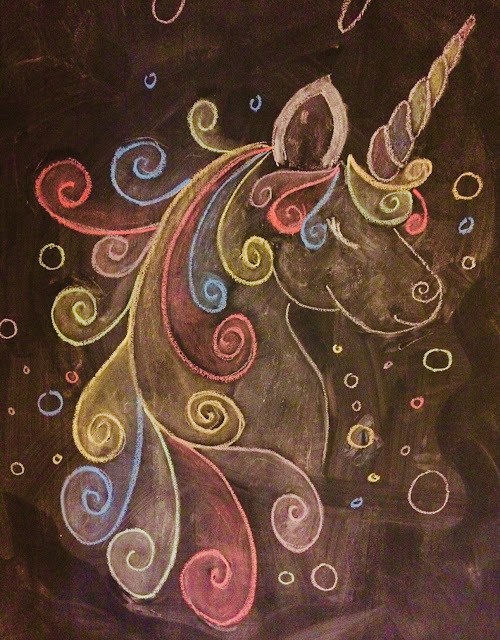 I think I will make the seahorse one day, too. The Frida Kahlo that I made for my good friend Chrissy was featured by Strawberry Butterscotch and by Nifty Thrifty Things! 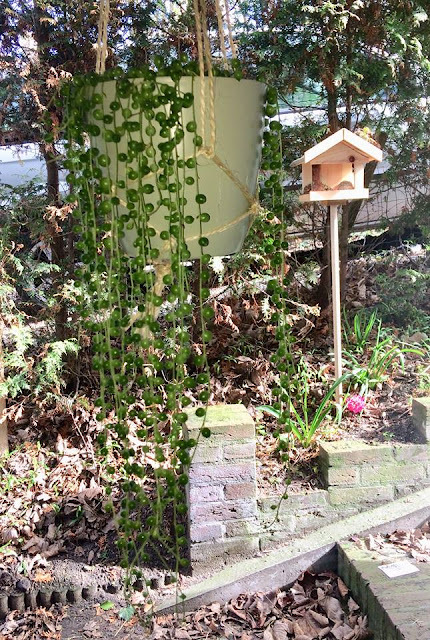 Thank you so much, Anna and Vanessa! Besides the Pusheen pinata I showed you last week, that I made for the birthday party for my now 10 years old daughter, I made a Pusheen cake. 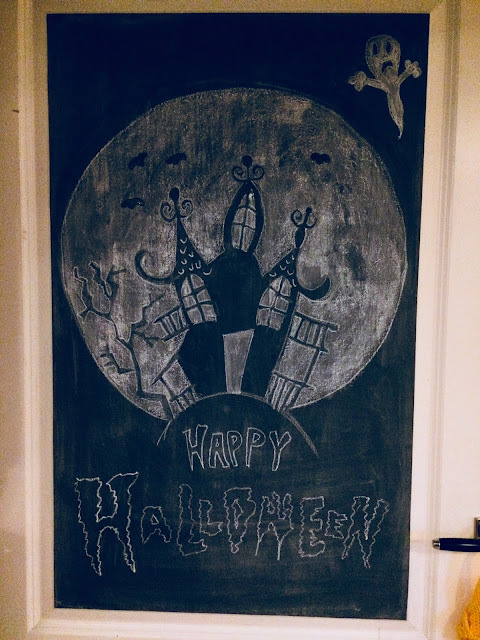 Didn't come off very well, but I'm used to that when it comes to decorating cakes and such. It's just not something I'm very good at. Sometimes I have a lucky shot, but most of the time it's below mediocre. 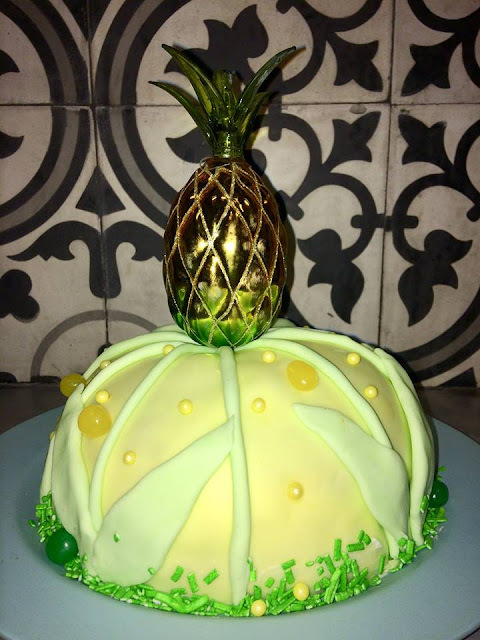 For this cake I used white chocolate for dripping, but after melting it with a bit whipped cream to make better drippings it didn't solidify enough, so all decoration I put on the cake afterwards slided of the round the edges of the cake. Things like this happen all the time when I'm decorating cakes. No problem at all, I almost expect it, so I'm not really disappointed. Just happy about everything that dóes look good on the cake, haha! But, on the other hand, if you have tips about solidifying white chocolate, then please tell me. The last one in the Lalylala Halloween Series I had to make was Diego Skull. 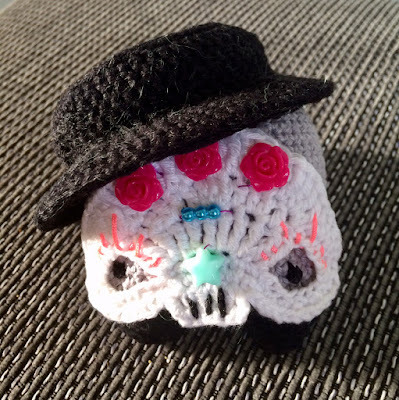 I made him Diego Sugar Skull, just because I love sugar skulls. I can't really say which one is my favorite, I like all three of them. Which one do you like the most? This weekend I visited a friend, whom I've known for years since the time we were still studying and worked as caissieres in a supermarket for extra money. Nowadays we both have children and live in different cities, but we try to visit each other at least twice a year. This year I only saw her once, last weekend to be precise, due to a new house and busy schedules in general. Besides the flowers, card and money for the new house, I gave her a handmade Frida Kahlo. 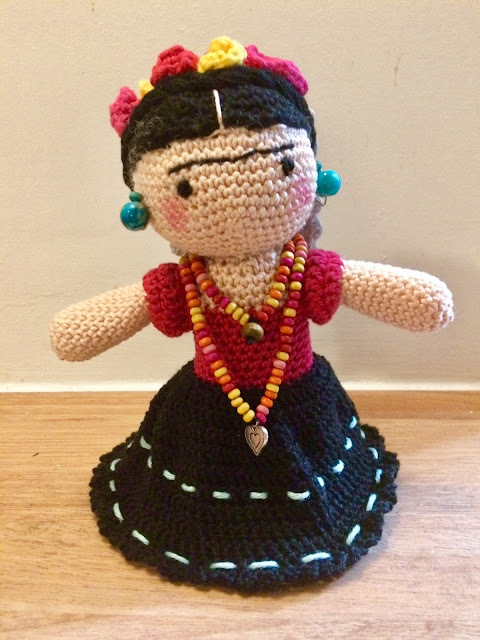 Last year she saw another Frida I made for a friend and she almost begged me to make one for her, too, for her Christmas stocking, but only now I had the chance to give Frida to her.